Summer is around the corner and it’s sad to say I’ve fallen off the wagon. You know… the one shaped like a carrot? Or a bell pepper if you’re me. I’ll have to admit, I’m an emotional eater and I think it’s safe to say that most of us are. So when life isn’t going according to MY plans (and when is it ever really) I tend to not care and just eat-everything. So as I’ve watched my bell pepper shaped wagon drift off into the sunset without me, I’ve gained weight and am pretty sad about it. However, eating healthy is my life style and emotional eating is just a phase. I mean how long can we really throw our selves a pity party before we realize its been last call for a month now??? Everyone has gone home and it’s no longer OK to say “It’s my party and I’ll cry if I want to”. So I’m done crying. Now I’ve caught up with my wagon and it only took a few asthma attacks and an inflamed IT ban along the way. But hey, I’m here! Here is an inspired dish I grew up on. There are MANY changes to this recipe from its original. I will let you guess what I’ve changed to make it healthy. I must say though that it tastes amazing even if it’s not exactly like my moms! 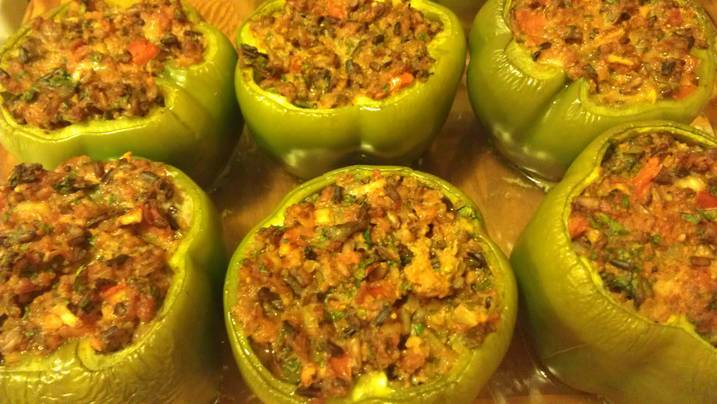 We’re making stuffed bell peppers tonight. (Surprised?!? HA! I did say my wagon WAS shaped like a bell pepper.) So what will you need? This is a 2 part recipe and It may seem like a lot but it’s not. 1 cup mixed medley or fancy mix of brown rice. 2 cups chicken/vegetable broth or water. Make rice following the instructions on the package. You can substitute the water recommended for the chicken or vegetable broth. Add chopped olives and pepper while rice is cooking. While your rice is cooking you can begin to prepare the stuffing. 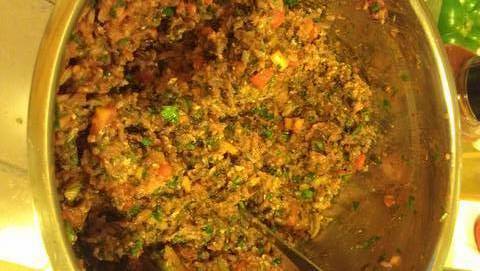 Chop tomatoes, cilantro, parsley and onion and put into a big mixing bowl. Add dill, paprika, tomato paste, salt and pepper to taste. Mix well. Once the rice is done add it to the mix. 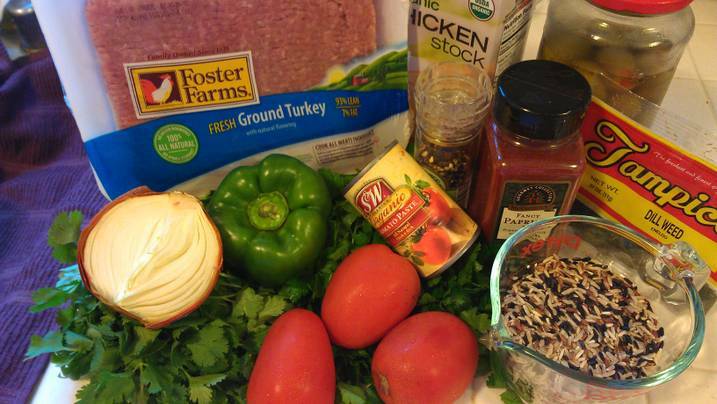 Once everything is mixed in well, add the ground turkey last. 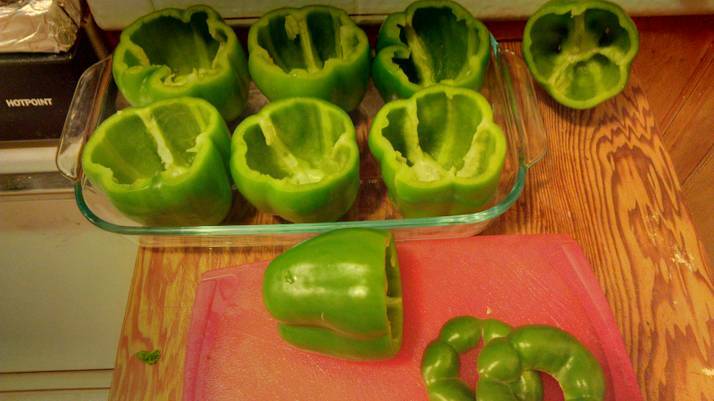 Wash your bell peppers and and slice just the tops off. This is the side with the stems. Clean out any seeds and stuff peppers to the brim with the turkey/rice mixture. 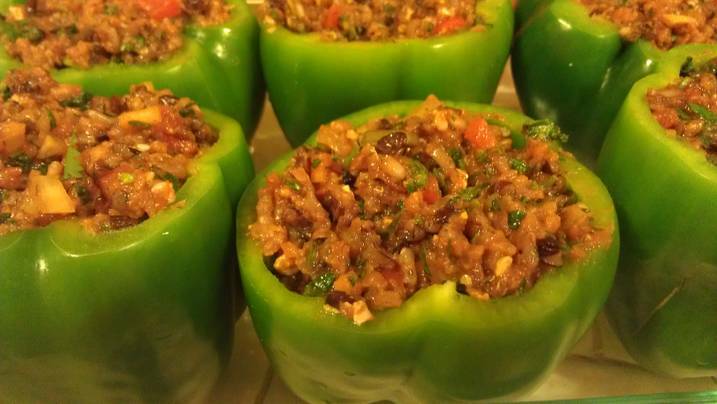 Add about 1/4 inch of water in the bottom of a glass baking dish and stand stuffed peppers in. Set your oven to 350 and openly bake for about 45 min. Serve with what ever salad you want for a yummy dinner or have it as a light lunch! This is a perfect way of filling up on a low fat meal that is not only yummy but has a serving of vegetables, good fats, fiber and protein! This recipe is a great base to build other flavors upon too! You can add cheese or other veggies like squash or carrots. You can even mix it up and add taco seasoning to the dish and add a can of corn and beans instead of the rice. The possibilities are endless! This entry was posted in Food, Health and Beauty, Miscellanious. Bookmark the permalink. I just realized the only thing I don’t like about stuffed peppers is green peppers. I’m going to try this out with yellow peppers! Yum!